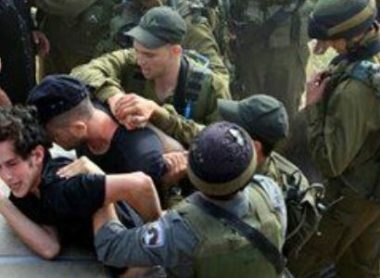 Israeli soldiers attacked, Tuesday, a Palestinian day laborer while working in Jaber neighborhood, in Hebron city, in the southern part of the occupied West Bank. Media sources said the soldiers stopped and detained the worker, identified as Ishaq Ezzat Jaber, in his forties, while carrying construction supplies to a work site. They added that the Palestinian suffered various cuts and bruises and was still detained by the soldiers at the time of this report. In related news, the soldiers injured many Palestinians, including schoolchildren, in and around two schools in Hebron city.